The first Chinese Customs flag was designed by H.N. Lay when in England to purchasing cruisers for the Chinese Government, 1861-1862. Following an inquiry from UK government, it was decided that the national flag of China would be a triangular one, yellow in color with a blue dragon facing the hoist. In 1862, the Chinese government directed that this emblem be flown in the center of the green flag designed by Lay. Soon after returning to China the flag fell into disuse until 1867 when the green and yellow flag bearing the St. Andrew's cross as designed by Lay was revived. It was replaced again in 1873 with a dragon ensign, - triangular yellow flag with a red sun (similar to the flag shown at 1872 Imperial Dragon Flag), which in turn was replaced in 1889 by a rectangular version of the dragon flag (similar to the flag at 1890 Imperial Dragon flag). In December 1912, when the Republic of China came into existence, the green saltire returned as the emblem of Chinese Customs. During the period of 1928-1931, a central device, the Kuomingtang emblem, was added to the flag. Until as late as 1949 the plain green flag with yellow saltire was flown as the Customs Jack. Circular No. 5 of 1867. Flags to be used by Customs' Vessels. 1.- I have to instruct you to direct all the Revenue Cruizers, Boats, and Hulks, belonging to the Office over which you preside, to fly a flag similar to that appended, numbered one. The colours are to be green and yellow; the flag is to be longer than it is broad, and, at the staff, it is to be somewhat broader than at the end. 2.-The Boats and Hulks belonging to the Harbour Master's department, are to fly a flag similar to the drawing, numbered two: the colours also to be green and yellow, and the Chinese characters black, with the addition of a foul anchor in red at the outer end. 3.-No other flags are to be made use of, except for signalling purposes, by the boats and vessels referred to. Circular No. 5 of 1873. Concerning the new Flag to be used by the Customs. I have now to inform you that that Flag [green ground, with yellow diagonal cross] is to be discontinued, and the new Flag [triangular, yellow ground, with red sun and blue dragon,] lately designed and prescribed for Chinese National Vessels, to be substituted. You will accordingly take the necessary steps to issue Flags of the proper kind to the various stations in your district, for the Customs Cruizers, Boats, Lightships, Lighthouses, and all other kinds of Customs property where the use of a flag is befitting. This seems to be a variation of the Chinese War Ensign shown in Whitney Smith's "Flags Through the Ages etc", page 108. A painting of the flag was sent to the Admiralty in 1887. A print copying the painting appeared in the 1889 Admiralty Flag Book. 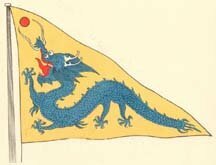 The painting had another red circle, in the upper left corner of the yellow rectangle, in the same position relative to the dragon, as in the triangular Dragon Flag (1872). This circle had been crossed out and was not included in the print.